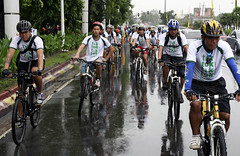 Some 70 bikers from the Makati City LGU and from the Global Campaign for Climate Action (GCCA)-member organizations before the 90 Days To Copenhagen Bike Tour. We all have the tendency to do countdowns. I remember when I was younger that I used to countdown the days of the week as it passes down towards the weekends. I’m pretty sure that I am not alone with this habit when I was a kid as I remember having classmates who did the same thing back then. But that doesn’t stop there, I counted down many things – the days remaining before my next birthday, before I finish 3rd grade, before I graduate from high school, the number of days before Christmas, the list just goes on and on. Perhaps it is because a lot of us like the adrenalin rush, of cramming things to meet a given deadline. Perhaps it’s because we’re all deep down complacent and we need to be reminded that there are things that we need to take action on NOW, because tomorrow may be too late.